Is This The $4.6 Million Lamborghini Veneno? Everyone, set your faces to stunned. If this magazine scan is accurate, Ferrari won't be the only one dropping a hypercar bomb on the world at the Geneva Motor Show. Say hello to the Lamborghini Veneno. 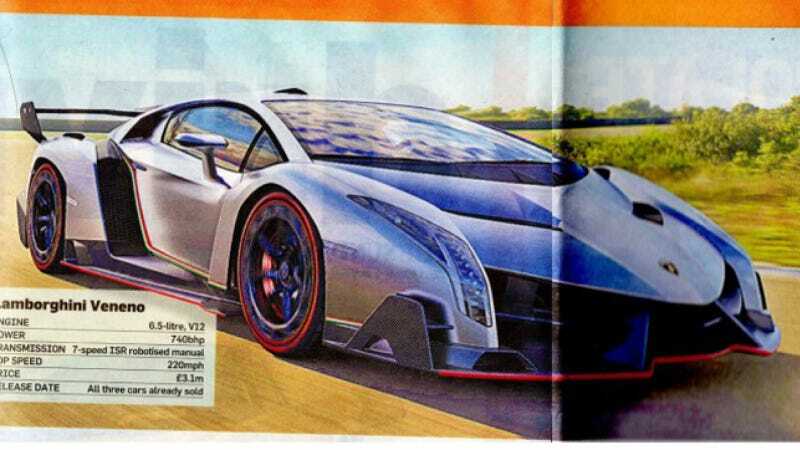 If these leaked magazine scans are indeed accurate, the car will have 740 horsepower from a 6.5-liter V12 and it will cost a staggering $4.6 million. It also looks like a spaceship Lambo from the distant future. Details from the scan say its name means "poison" in Spanish; it is the most powerful production Lamborghini ever; its carbon fiber monocoque chassis comes from the Aventador, and it will only be available in green, white and red, the colors of the Italian flag. Is this the real deal? We'll find out at Geneva this week. UPDATE: Polish auto news site AutoGEN.pl has a few additional details that substantiate what we've seen in that magazine scan. They also report that the car will do zero to 60 mph (zero to 100 km/h) in under three seconds with a top speed of 220 mph. Not bad at all.